We belive that the Christian life is not something that we can live out on our own. In these groups, we strive to study the Scriptures and encourage one-another in our walk with Christ. 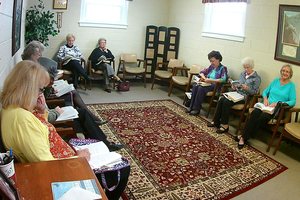 Our Sunday School classes meet throughout our building at 9:30 on Sunday morning. 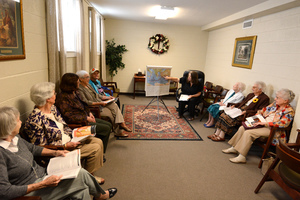 All classes are friendly and welcome visitors from all walks of life. If you would like to visit a class, it would be best for you to park behind our building and enter from the rear. There will be someone at the door who will greet you and point you to the right place. This is a mixed group of ladies ranging in age from 36-87 and we welcome those older or younger! We feel this is a positive as we learn from one another. We have at least one white elephant auction each year and the funds raised are given to a ministry of our choice. This class usually does curriculum written by great Bible teachers like Dr. David Jeremiah. They study their lesson throughout the week. When they gather together they listen to audio teaching about the passage, then discuss what they have learned. 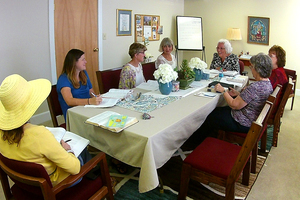 This class is mostly senior adult ladies and they use the Explore the Bible curriculum.